A petmom’s request for help made to a cat rescue group last week resulted in her missing cat being returned home to her after nearly a year. A petmom’s request for help made to a cat rescue group last week – combined with some luck and dovetailing circumstances – resulted in her missing cat being returned home to her after nearly a year. Shelly Fairbrother and her family including cats Chelsea & Mojo moved from Poole, UK to Williams Close, Rowner, near Gosport, about 50 miles way, in August of 2014. The two cats proved to be escape artists, with Mojo breaking through a locked cat flap on only the second day in their new home and Chelsea following him into the great outdoors. Neither cat was microchipped but with the help of nearby Gosport Cats Protection (CP) volunteers Shelly was happily reunited with Mojo who was reported to the charity as a stray in a neighboring road in September. Shelly took the sensible action of getting Mojo microchipped. Though Mojo went missing again a short while later this feline Houdini was found in March 2015 and once more home with Shelly. Mojo’s microchip really helped in getting him home as it was quickly established who his owner was. Sadly, Chelsea remained missing and despite it being nearly a year since she’d gone AWOL, Shelly decided she’d try one last time to find her beloved cat. Shelly had seen the posts of Lost & Found cats on the Gosport CP branch website and Facebook pages and she e-mailed volunteer Carole Rudin jst last week, on July 18, asking for help. Deep down Shelly didn’t really expect to see Chelsea again but thought it wouldn’t do any harm. The next day, Carole received a phone call from Richard Thomas of Harding Road, Gosport about a cat that had been around for several months. Richard had asked neighbors but no one appeared to own it or know where the cat came from. 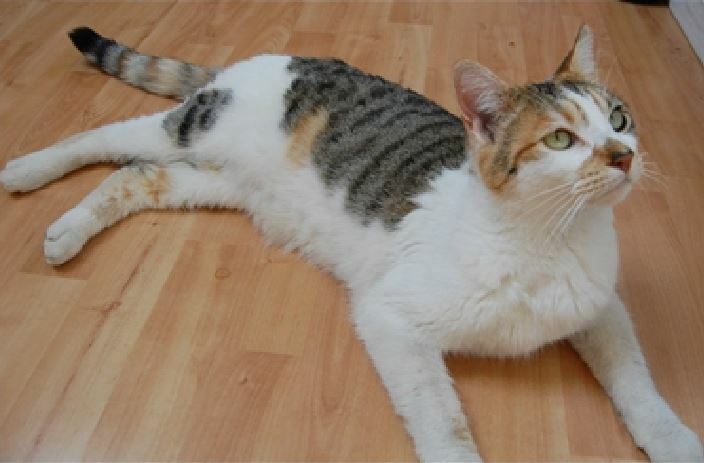 A CP volunteer went out that afternoon to scan the cat for a microchip but there was none. This pussycat was so friendly and very affectionate. Carole said that as she’d only received the e-mail from Shelly the day before it crossed her mind whether the stray cat in Harding Road could in fact be Chelsea. A paper collar was put on the cat asking the owner to contact CP. Carole went home and checked her file of reports of lost cats. She thought there was a good likeness of the Harding Road cat and Chelsea so she e-mailed Richard for his opinion. He confirmed his stray cat was indeed Chelsea. Carole phoned Shelly straightaway to tell her the good news. Shelly was very emotional and met Carole and Richard at Harding Road where she was delighted to be reunited with Chelsea, the cat she thought she would never see again. Shelly was thrilled to be able to take Chelsea home and so appreciated the kindness of Richard and his wife Helen and their neighbors Adam & Vicky for looking after and feeding Chelsea and of course for alerting Gosport CP of the ‘stray’ in their road. 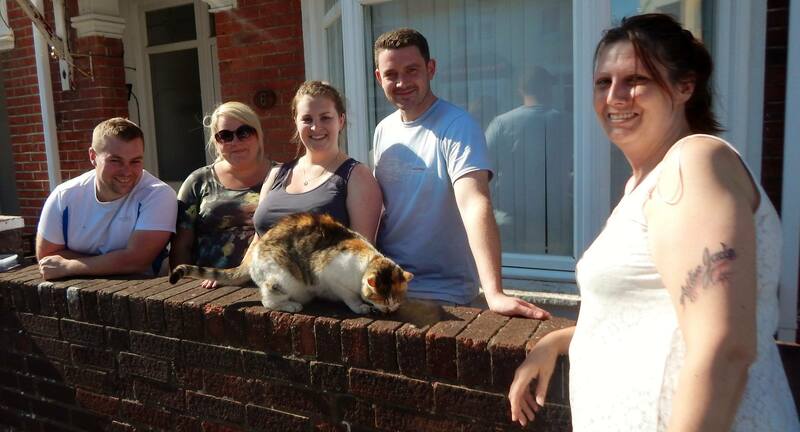 Gosport CP are ecstatic to have reunited the long-missing cat with her owner and Shelly said “I cannot thank you enough for all your hard work and the wonderful people who fed her”’. Gosport CP is run entirely by volunteers who give their time to help cats, both owned and those in CP care and the charity extends their thanks to Shelly for her generous donation of £50. Shelly wrote with an update at the Cats Protection Gosport Town Branch Facebook page on Tuesday, saying: “Chelsea is doing great, she’s still a little scared and unsure. Health wise she’s lost weight and is a small 5 kilos (small for her as she used to be a pampered princess) and has a slight eye infection. However, she is now microchipped and her vaccinations are now up to date. Tomorrow she gets her worming tablet and we’ll be bathing her in a few days and then I can get her back on her advocate to get rid of her fleas. “I truly thank God that CP exists and will be making sure everyone knows about the wonderful work you all do for our feline friends.